The G-Flex® Technical Safety Glove range combines an lightweight polyurethane foam, nitrile, T-Touch and gripper coatings on seamless nylon liner providing extreme comfort with excellent dexterity, sensitivity and tactility. The Gflex glove range is ideal for all applications where protection from light nicks and cuts are required and which require a high level of dexterity and sensitivity, especially where grip is important in oily and greasy conditions. Ideal for handling small parts and components, metals and glass industries, general assembly, machining, micro-engineering, tubes, tools & precision parts, automotive components, white & brown goods, painting, horticultural and maintenance tasks. The Gflex range has a glove to suit all workshop applications to ensure you have the best technical glove for your worksite. The G-Flex foam combines a lightweight foam coating on a seamless nylon liner. The G-Flex® Lite safety glove combines an ultra-lightweight polyurethane coating on a seamless nylon liner. 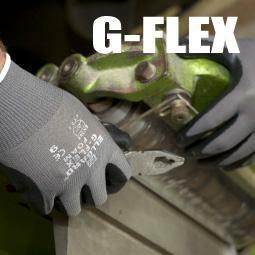 The G-Flex® Nitrile safety glove combines a super light weight nitrile on a seamless nylon liner. The G-Flex Red Devil combines a lightweight grey crinkle finish latex coating on a seamless red 120g nylon liner. The G-Flex SandStorm combines a lightweight grey "sandy foam" finish nitrile coating on a seamless black 120g nylon liner. G-Flex® T-Touch Technical Safety Glove - Black T-Touch coating on seamless Black Nylon liner.